Mike McGuire is an NRA, USA Shooting Team and NSCA certified shotgun instructor. 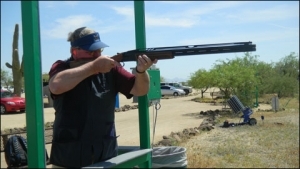 He is a Life Member in the ATA, NSCA and the Arizona Sporting Clays Association. Other current and past affiliations include the Ohio State Trapshooting Association, National Shooting Sports Foundation Member, the Ohio State University Trap Club and the Arizona State University Clay Target Program. He is a Contributing Writer to Trapshooting USA and Sporting Clays magazines. The web site for “Aim High, Shoot Straight©” Shotgun Clay Target Sports Score Sheets is under construction but you can contact Mike at 480-488-3500 or mmcguire@shootingshotgunsports.com. "Build a better mousetrap, and the world will beat a path to your door" is attributed to Ralph Waldo Emerson. "Necessity is the mother of invention" is a phrase that was to become a metaphor about the power of innovation.